Dr. Antony Moore knows smokers often won't quit to protect themselves or their children. But he hopes his new study tying second-hand smoke exposure to the most common kind of feline cancer will persuade some people to kick the habit. "I think there's a lot of people who might not quit smoking for themselves or their family," said Moore, a veterinarian at Tufts University. "But they might for their cats." In the study, Moore and other researchers at Tufts and the University of Massachusetts say living in a household with smokers considerably increases a cat's risk of acquiring feline lymphoma, which kills three-quarters of its victims within a year. The researchers, writing in Thursday's issue of the American Journal of Epidemiology, studied 180 cats treated at a Tufts veterinary hospital between 1993 and 2000. They found that, adjusting for age and other factors, cats exposed to second-hand smoke had more than double the risk of acquiring the disease. In households where they were exposed five years or more, cats had more than triple the risk. In a two-smoker household, the risk went up by a factor of four. It's difficult to say how many cats get feline lymphoma, believed to be caused by a leukemia virus, scientists said. Lung cancer rarely strikes cats. Moore hopes the research will inspire others to take a closer look at the connection between smoking and lymphoma in humans. 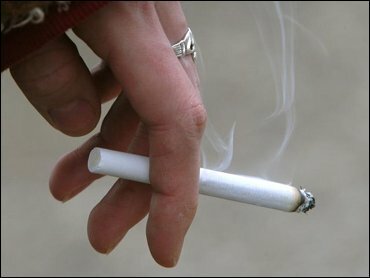 Some studies have suggested a higher lymphoma risk in children of smokers, but there has been no definitive work. Bernadine Cruz, a veterinarian in Laguna Hills, California, isn't surprised by the study's results. She has warned people for years about respiratory damage smoke can cause in pets, and has no doubts the smoke has other effects as well. "We do know that the environmental stresses put on our bodies, that often cats and dogs will endure similar stresses, and they're almost magnified because their lifespans are so condensed," she said. The same researchers plan a similar study on dogs. The source of canine lymphoma is also unclear, though it's possible cats may be more vulnerable. "They accumulate a lot on their fur," Moore said. "In a veterinary clinic if a cat comes in, you can tell if it's in a smoking household because it smells of smoke." Dogs, he said, tend to go outside and are washed more.